Excellent estate condition signed Yves Saint Laurent Brooch from France. Laurent used high quality 24 kt. gold plating on all his jewelry. Gold plated link necklace with magnetic closure and zena link necklace extender. 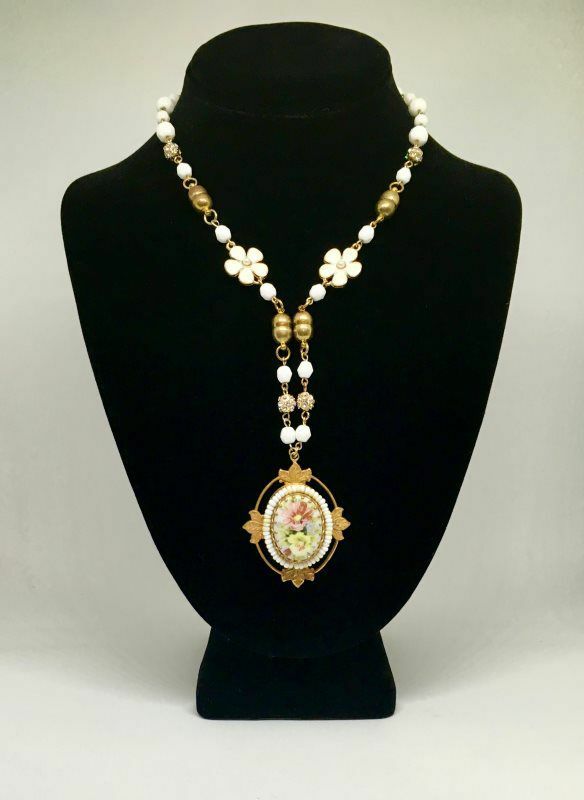 Early Miriam Haskell signed, hand-painted floral pendant cameo. Excellent estate condition. 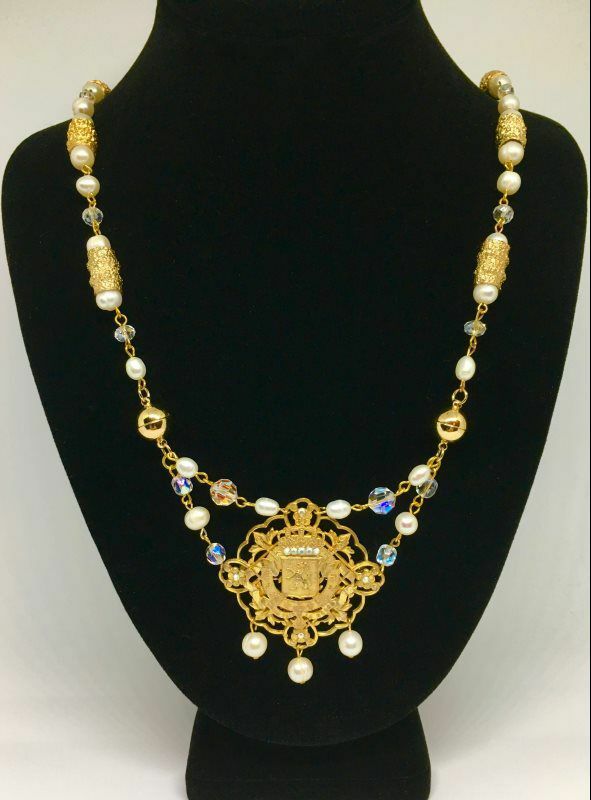 Faceted white milk glass beads and gold, hand-set crystal rhinestone necklace. Detachable cameo pendant may be worn as an accesory on a pashmina scarf, shawl, etc. 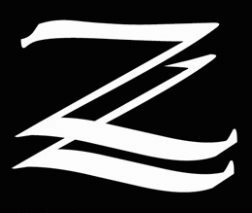 Magnetic daisy Zena Links included. 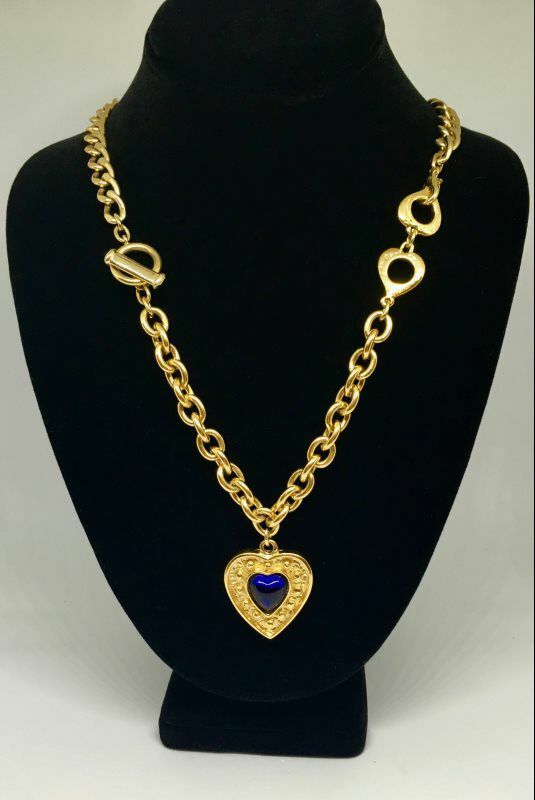 Highly collectible vintage gold tone bracelet YVES SAINT LAURENT with heart charm featuring a purple cabochon on one side, and the YSL iconic logo on the reverse. 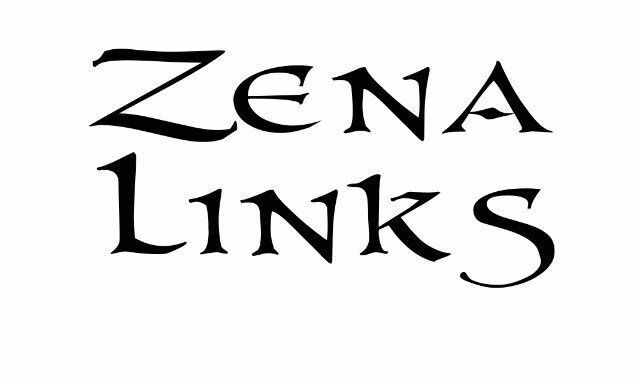 Zena Link necklace extender is three percent solid gold. Handwritten "Yves Saint Laurent" and "Made in France" on the "Love"clasps. Excellent vintage condition (Grade : A). Couture designer Christian Lacroix crowned his name on this rare 24 karat gold plated pendant. 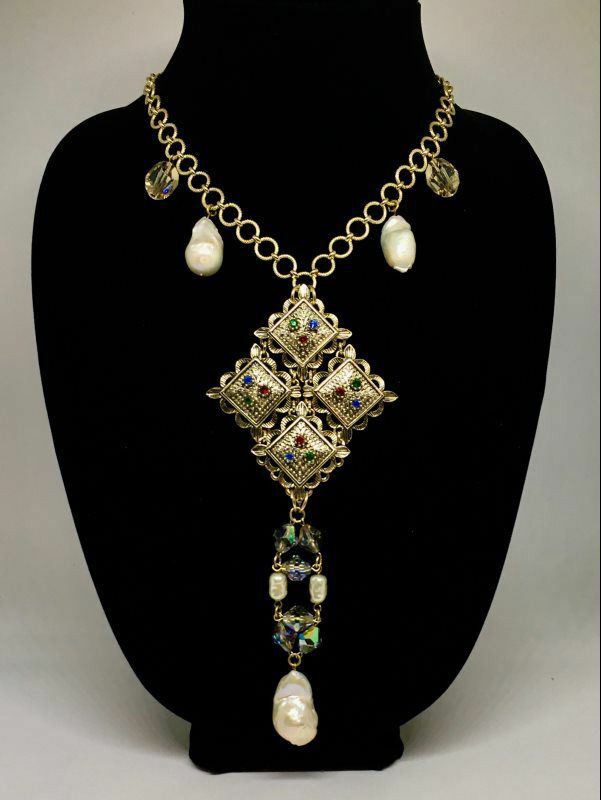 Created for his 80's jewelery collection, this Parisian estate find is in excellent condition. Three precision cut, precious purple spinels have been added to enhance the design. Gold plated links, adorned with wire-wrapped black cultured pearls, accompany a matching set of Zena Links with gold plated and crystal magnets. Art deco influences shine through the design of this authentic signed Miriam Haskell Brooch. Haskell owned a successful New York based jewelry company from the 1920's to the 60's. Her pieces are highly collectible today. 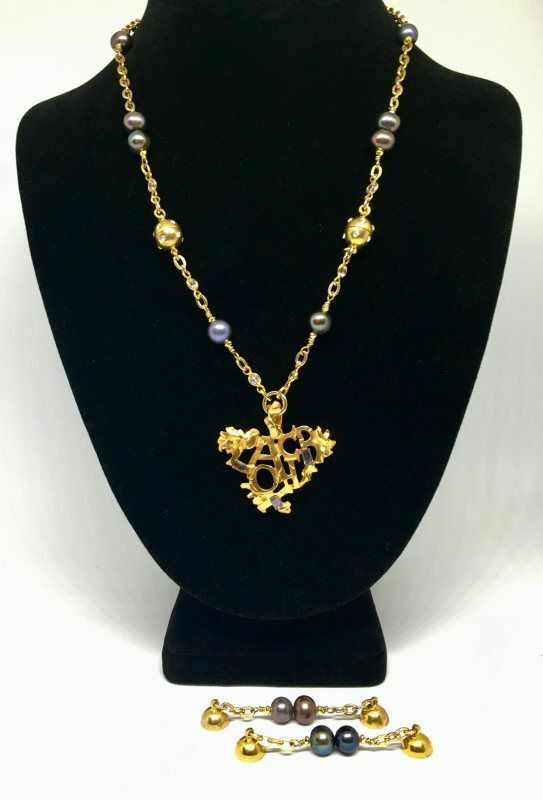 Length of the necklace is freshwater pearls with crystals set in gold bezel tubes. 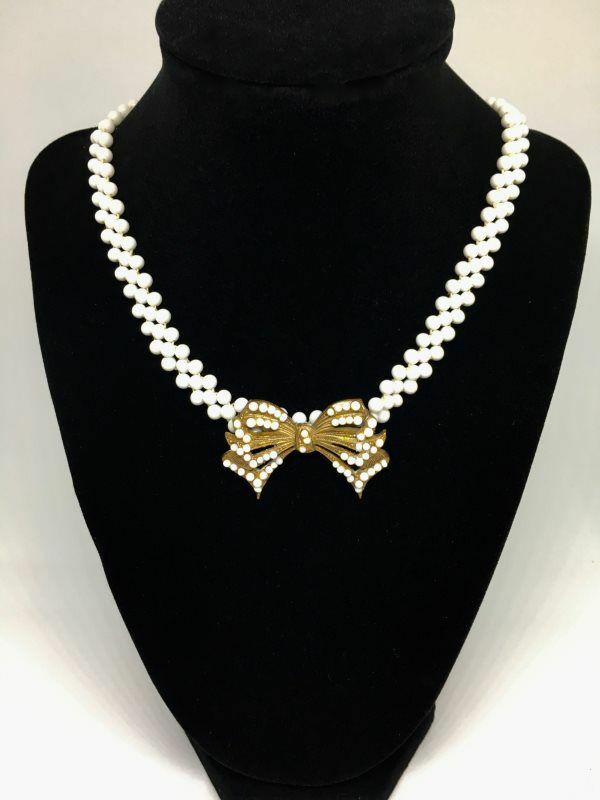 Gold plated magnetic pearl Zena Links included. 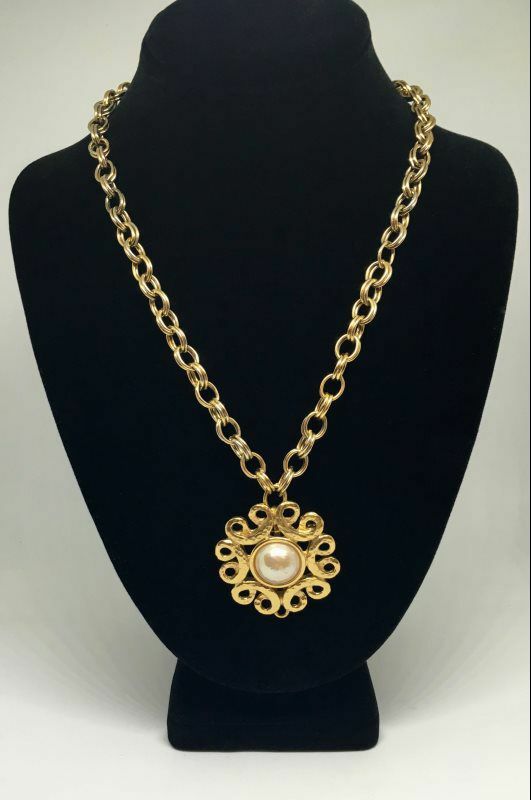 Considered to be an unsigned Miriam Haskell necklace. Construction resembles her early work. 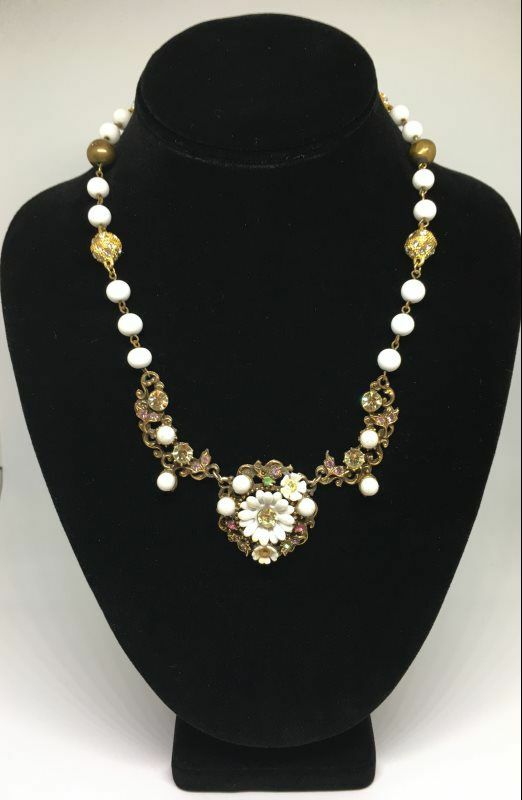 Milk glass white beads and multi colored crystals set in antique french brass. Set of white porcelain Zena Links, with crystal beads and gold crystal magnets included.